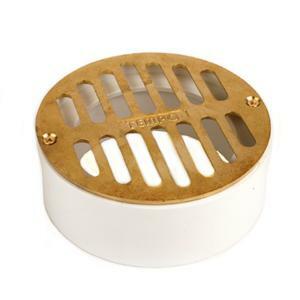 Round Flat Brass Grate W/PVC Collar are premium brushed satin solid cast brass secured to a PVC collar with 2 brass screws. The PVC collar can be permanently solvent welded to appropriate size sewer and drain fittings or Schedule 40 pipe to prevent theft. *Maximum load based on weight uniformly applied across entire grate surface.